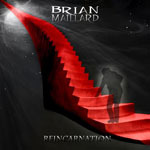 Share the post "Album review: BRIAN MAILLARD – Reincarnation"
Brian Mailliard is an accomplished guitarist who came to wider attention with the band Solid Vision and perhaps more widely with the ill-fated if rather good Dominici albums (2005-7) fronted by original Dream Theater vocalist Charlie Dominici. Maillard’s first solo album was ‘Melody In Captivity’ (2009). ‘Reincarnation’ is the latest solo outing and an exercise in superlative guitar-based fusion. Maillard really shows how it’s done with each composition always rooted in a melodic and a distinctly European approach. Maillard is Swiss-based. Highly melodic and riff-driven with a good tune never sacrificed to overt musical dexterity, Maillard combines the perfect blend of tension and release. Taste is then the guiding feature and in his quest he’s ably accompanied by his brother Yan Maillard (drums) whilst adding his own keyboard textures and bass on most tracks. The highlight has to be ‘Evergreen’ which combines a monster riff with a compelling melody and reminds me of another great European contemporary player, Marco Sfogli, although ‘Another Life’ is the best ballad and also deserves special attention. ‘Theory Of Relativity’ features some Zakk Wylde-esque riffage but always keeps the listener’s attention in spite of several time changes and a Eric Johnson fusion-inflected mid-section. And of course, the spirit of Satriani is ever-present on tunes like the title track although Maillard injects his playing with a satisfying metal thrust, whilst not averse to Satriani-esque titling as on ‘Bulldog Ants’. This entry was posted in ALBUM REVIEWS, ALBUM REVIEWS (Mobile), All Posts and tagged album, Brian Maillard, Dominici, Dream Theater, fusion, guitar, guitarist, instrumental, Reincarnation, review, rock, Solid Vision, Swiss. Bookmark the permalink.